Owner of Renfrow Hardware, is a Matthews native and He graduated with a BS in Mechanical Engineering from NCSU in the ‘80s and immediately purchased the hardware store from the Renfrow family. He is a visionary and has developed the unique Renfrow niches with decades of hard work and lots of fun! David and his wife, Mary Beth, have been married for 30 years and have three daughters. Mary Beth is a meticulous record keeper and organizer and is also very artistic. She has created all of the helpful gardening posters and signs posted around the store and greenhouse over the years. Daughter of David and Mary Beth Blackley of Renfrow Hardware, resides at Renfrow Farms with her husband Matthew. Matthew and Pressly met while both studying engineering at NCSU. Upon graduation, Pressly rejoined the family business and works at the hardware store and manages Renfrow Farms (clickable link to website), which was started in 2011. 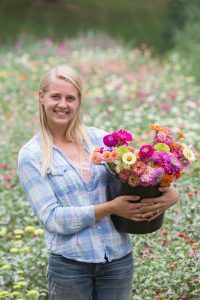 Pressly especially loves growing cut flowers for weddings and events, though her absolute favorite crop will always be tomatoes! Mark joined the Renfrow crew in the early 1990s upon transplanting to Matthews from Sandusky, Ohio, and he and his son have remained in Matthews to this day. Mark knows more about the appliance parts we stock than any of us and has been working in hardware stores for over forty years. He repairs, rescreens, and custom-builds window screens for customers during our Tuesday shop workdays each week. Forever a Buckeyes fan, Mark can often be found at the various sports bars in downtown Matthews and knows just about everyone around town. Dennis is a lifelong Charlotte resident and has worked at hardware stores since he was a young boy. Dennis and David met while working together at Independence Hardware, which used to be near East Mecklenburg High School. Dennis joined the Renfrow crew in the mid-nineties. He is very gifted with engine repair and keeps our fleet of forklifts, tractors, chainsaws and other small engines running. He also sharpens your knives and lawnmower blades and repairs tool handles on Tuesday workdays in our shop, when the store is closed to customers. Sid has been at Renfrow’s since 2011. He and David met in Boy Scouts back in the seventies and are lifelong friends. Before coming to Renfrow’s, Sid was a welder for twenty years. He got his start with us by fabricating all of the carts and racks we use in our greenhouse, which extremely increased our capacity and productivity. Sid also crafts the amazing heavy-duty fire kettles (hyperlink to fire kettles page – to go under Specialty Products menu) that we sell at the store. Today Sid divides his time between many hardware store and farm duties. David’s sister, worked full time at Renfrow’s in the early nineties primarily in the greenhouse and at the seed counter. After taking a couple decades off to raise four children with her husband, Brett, Ruth rejoined the Renfrow crew to do things that she loves – working in the fields at Renfrow Farms, harvesting beautiful flowers and produce, and helping build the Renfrow community of backyard gardeners, once again at the seed counter and in the greenhouse. Gaspar usually helps load the fertilizer and chicken feed into your car at Renfrow’s, takes care of all the chicks, chickens, and crickets that pass through the doors of the store, and keeps Renfrow’s as clean as a 120-year-old building can possibly be. 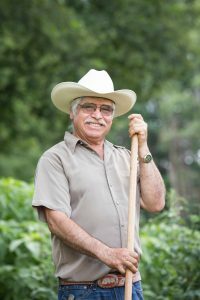 Gaspar feels especially at home with a hoe in his hand and a row of well-weeded plants behind him up at our farm. He is responsible for much of the farm’s beauty and well-tended fields. Gaspar has worked at Renfrow’s since the late eighties. He and his wife and three daughters and their families all live in the Matthews area. 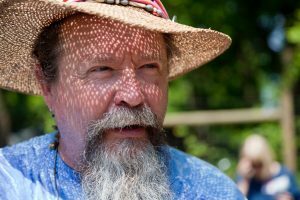 Many in Charlotte fondly know Ted as the “Plant Doctor” due to his long-running local radio show about gardening. 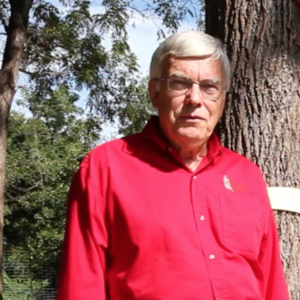 Ted was an extension agent with Mecklenburg County for his entire career. Upon retirement, he enjoys hanging out at Renfrow Hardware on Saturdays from 10am-2pm, where he interprets customers’ soil test reports, teaches them how to grow great fescue lawns (link to fescue lawn calendar pdf), diagnoses plant diseases and pest problems, and expands the gardening knowledge of everyone with whom he converses. Jeff has been a gardener his entire life, and has decades of knowledge and experience to prove it. Jeff teaches many of the gardening classes hosted at Renfrow’s throughout the year and offers backyard garden consultations. He can also be found working in the Renfrow backyard and greenhouse on most Saturdays in the springtime. 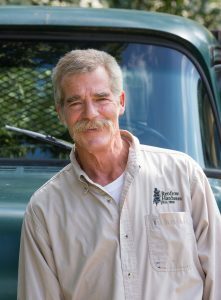 Throughout his career, Jeff has been a farmer, farming business instructor, nurseryman, organic fertilizer salesman, NC Cooperative Extension Service agent, and more.